Taipei City is the capital of the Republic. Situated at the northern tip of the island of Taiwan, Taipei is located on the Tamsui River; it is about 25 km southwest of Keelung, a port city on the Pacific Ocean. The Caesarpark Hotel Taipei From TWD 3900. Royal Biz Taipei From TWD 3300. There are 12 administrative districts in the Taipei City, including Songshan, Xinyi, Daan, Zhongshan, Zhongzheng, Datong, Wanhua,Wenshan, Nangang, Neihu, Shilin, and Beitou. Due to the varied topography, economic development and time of development, the population is unevenly distributed. Daan, Songshan and Datong districts are the most populated. Taichung city located in west-central Taiwan, with a population of just over 2.6 million people, making it the third largest city on the island after Taipei and Kaohsiung Taiwan Holiday. Evergreen Laurel Hotel Taichung From TWD 3000 Taiwan Accommodation. Temple, built during the Qing Dynasty. Chishan Gate, built during the Qing Dynasty. Taichung’s historic city hall. Shinto Shrine to Japan’s WWII soldiers fighting overseas. Shrine to the martyrs of the Republic of China. Taichung City Council building. Bulls. National Museum of Fine Arts. Lin Family Shrine. Originally built in Dali, Taichung County during the Qing Dynasty and later moved to Taichung City. Wen Chang. Temple in the northern part of Taichung City. Built during the Qing Dynasty. Wanhe Temple built during the Qing Dynasty. National Taichung University. Taichung Railway Station. The Taichung Downtown Bus Plaza, one block from the Taichung Train Station. Hualien County is the largest county in Taiwan and is located on the mountainous eastern coast of Taiwan. It contains the island’s largest port Taiwan Holiday. C’est Jeune Hotel Accommodation Taiwan. The county borders the Pacific Ocean to the east and is hemmed in by the Central Range to the west. With its towering peaks, azure skies, vast seas, scenic valleys, cultural diversity, and friendly kindhearted people, Hualien has become one of Taiwan’s first-choice travel destinations for local and international visitors alike. With all of its natural beauty, most of Hualien is a national scenic area. Visitors to the county can enjoy the impressive gorges at Taroko National Park, the magnificence of Yushan National Park, the stunning natural landscapes of the East Coast National Scenic Area, and the rustic charms of the East Rift Valley National Scenic Area. Wherever you go in Hualien, nature is there to greet you. Citizens of 31 countries, including the United States, Canada, Australia, New Zealand, Ireland, and most other EU members and Switzerland, may enter Taiwan visa-free for up to 30 days (90 days for citizens of Japan and the United Kingdom) provided that their passports do not expire within six months. Residents of Hong Kong and Macau who hold valid SAR passports should apply for an entry permit, which can be done on arrival or online before departure if they were born in their repective territories or have been to Taiwan previously after 1983. From July 2008, holders of mainland Chinese passports may visit Taiwan for tourism if they join an approved guided tour. For further information consult the Bureau of Consular Affairs. Taiwan’s main international gateway is Taiwan Taoyuan near Taipei, with Kaohsiung a distant second and very limited international services to Taichung and Hualien. Taiwan Taoyuan International Airport (formerly Chiang Kai-Shek International Airport) (TPE) is Taiwan’s main international airport. 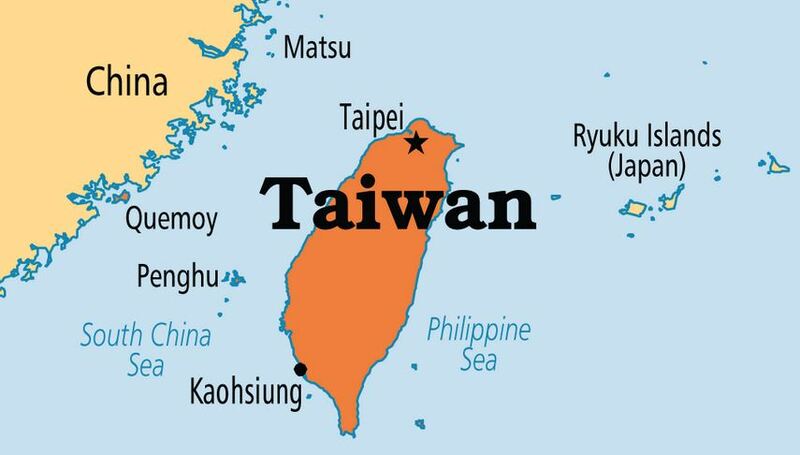 Located 40km to the southwest of Taipei, it has good connections to major Asian cities and North America. The airport has direct buses to Taipei, Taichung and other nearby cities. Alternatively, the U-Bus company operates shuttles to HSR Taoyuan station for high-speed train connections to Hsinchu, Taichung, Chiayi, Tainan, and Kaohsiung; and to Jhongli Transit Station, for mainline TRA train and southbound bus connections to Tainan, Hsinchu etc. Songshan Airport (TSA) in downtown Taipei serves mostly domestic flights only, plus limited daily charter flights to mainland China. The Kaohsiung (KHH) domestic and international airports are located in the same complex. International flights are only to other Asian cities, as well as charter flights to mainland China. Taichung Airport (RMQ) serves domestic flights as well as international flights to Hong Kong and Vietnam and cross-strait charters to mainland China. Hualien Airport (HUN) serves domestic flights as well as some international charter flights to Japan, South Korea and Macau. It is also one of the airports designated to serve cross-strait direct flights. In addition, the airports at Makung, Taitung and Kinmen have also been designated for cross-strait flights to mainland China, though of these, only Makung currently has regular flights to mainland China. After a break of 60 years, regular cross-Strait flights between Taiwan and China started on July 4, 2008. From December 15 2008, the frequency of these flights were increased to daily, and travel times on some popular routes have been reduced significantly as flights no longer have to be routed through Hong Kong airspace. Previously, the usual practice was to fly via either Hong Kong or Macau, which have good connections both ways. The main Taiwanese carriers are China Airlines and EVA Air. China Airlines has a relatively poor safety record (12 major crashes in 30 years , whereas EVA Air is ranked one of the safest airlines in the world; as a result, many opt for EVA Air whenever possible. AirAsia X (LCC) from/to Kuala Lumpur only. Jetstar Asia (LCC) from/to Singapore only. Taiwan’s main domestic carriers are Mandarin Airlines , a China Airlines subsidiary; UNI Air , controlled by EVA; and TransAsia Airways . Flights are frequent, and it is usually unnecessary to book flights in advance. Taipei and Kaohsiung have regular services and links to most other domestic airports; however, it may not be possible to fly from one domestic airport to another. The popularity of the high-speed train has drastically cut flights on the once popular west coast sectors, with eg. Taipei-Kaohsiung flights only a shadow of what they once were. If you want to visit Taiwan’s smaller islands, the plane is still the best option, and is the only practical option of travelling to Penghu, Kinmen or Matsu. Fares are not too expensive, and local planes are very good. The domestic airport in Taipei is Song Shan Airport , which is in the north of the Taipei and easily reached by Taxi. Domestic destinations include Kaohsiung, Tainan, Chiayi, Taichung, Pingtung, Taitung, Hualien, Makung (Penghu / Pescadores), Kinmen, Hengchun, Nangan and Beigan. Travelers heading to Kenting can avail themselves of the direct and frequent bus service from Kaohsiung airport that connect with flights arriving from Taipei. Taiwan’s train system is excellent, with stops in all major cities. Train stations are often located in the centers of most cities and towns and serve as a convenient hub for most types of transportation. In addition, the train system allows you to bypass the highways, which can become extremely crowded on weekends and national holidays. The new train backbone is Taiwan High Speed Rail (HSR, 高鐵 gāotiě) , a bullet train based on Japanese Shinkansen technology that covers the 345km route on the West Coast from Taipei to Zuoying (Kaohsiung) in 90 minutes. Other stops on the route are Banqiao, Taoyuan, Hsinchu, Taichung, Chiayi and Tainan, but note that many THSR stations have been built a fair distance from the cities they serve (e.g. a taxi from downtown Tainan costs up to NT$400, but there’s a free shuttle bus). A one way ticket from Taipei to Kaohsiung costs NT$1490 in economy or NT$2440 in business class, but economy seats have plush seats and ample legroom, so there’s little reason to pay extra. All signage and announcements are in English as well, making navigation a snap. Bookings are accepted online and via phone up to two weeks in advance at +886-2-6626-8000 (English spoken), with payment required only when you pick up the tickets. Credit cards are accepted. Mainline trains are run by the separate Taiwan Railway Administration (TRA, 台鐵) , whose services are generally efficient and reliable. Reserving tickets well in advance is recommended when traveling with the train on weekends, especially for long distance travel. Slower (but more frequent) commuter trains without reserved seating are also available. Train timetables and online booking (up to 2 weeks in advance) are available on the TRA website; however, the online services only work between 8AM and 9PM or thereabouts and there is a small charge, NT$7, for online bookings. Note that booking online only establishes a reservation as there is no Internet payment option. You must pay for the tickets you reserved at your local train station or post office to actually receive it. Children under 115 cm height go free, and taller kids shorter than 145 cm and under 12 years of age get half-price tickets. If you get return tickets there is a small discount depending upon travel distance. There are also vending machines at the larger stations. Round island tourist rail passes are also available which allow the holder to embark and disembark a set number of times for a fixed price are also available at most larger train stations. A foreign passport may be required for purchase. Take A Break Holidays takeabreakholiday, Taiwan Accommodation.